In today’s time, most of the web developers prefer WordPress to build the website. The website created through WordPress needs some plugins to implement On-page SEO techniques. To help in SEO of the website, a plenty of SEO plugins are available on the internet. So, the question arises which one you should install? As per the experience and widely used by most of the big digital marketers “Yoast SEO” plugin seems to be perfect. Yoast SEO is used by the millions of WordPress users. ‘Yoast SEO’ got its life in 2008 as an SEO tutorial. But in 2010, it became the official WordPress repository. At that time, it was known as WordPress SEO by Yoast or WordPress SEO. The plugin was rebranded in 2015 as “Yoast SEO”. Now Yoast SEO is one of the most popular and most downloaded WordPress plugins of all time. 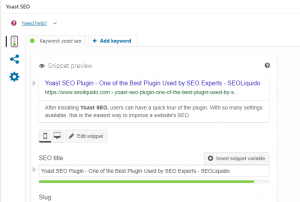 After installing Yoast SEO, first-time users get an option of a quick tour of the plugin. With so many settings available, this is the easiest way to find the relevancy of your website. 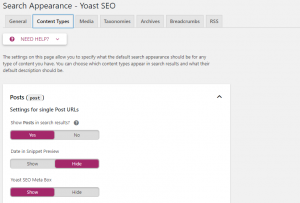 Yoast SEO’s settings can be found by exploring to “General” under SEO section, where you’ll have the option to switch between five tabs. The Webmaster Tools tab is especially helpful, enabling you to incorporate your site with four integral programs, especially Google and Bing, yet in addition Alexa and Yandex. By switching between the tabs, you can find the option to specify a title template for all the pages of your WordPress website such as, homepage, posts, pages, custom post types, categories, tags, and archives pages. You can also get the option to choose whether you want to ‘no index’ a particular post type by default, enable the Yoast SEO meta box or display a date in search engine snippets. If you are in search of a content analysis tool, then Yoast SEO is one of the best to choose. You can see the content analyzer tool in a meta box just below the WordPress text editor. There is one more feature and that is “Snippet Editor”. This editor allows you to define how your content should appear in the SERPs. Now, Next step is the “Content Analysis tool”. To use this tool, simply write your focused keyword(s). According to your defined keyword, Yoast SEO analyses your whole content against 12 SEO ‘best practices’. For example, keyword density, user readability, and the number of outbound links are all considered. It also checks that whether your keyword is used in the SEO title, meta description, and in the first paragraph of your content. There is an indicator like ‘traffic light’ which is there to help you to identify the areas you can do improvement. Obviously, the aim is always green. Yoast SEO has built in XML Sitemap Generator. Your content needs to get indexed only after that you can get rank on search engine. 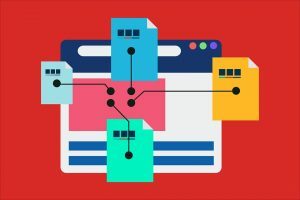 To get indexed completely and properly, your website should have an XML Sitemap. Fortunately, Yoast SEO offers built-in XML Sitemap functionality. You can enable your XML Sitemaps by navigating to XML Sitemap under SEO settings. When you successfully activate Sitemap for your site, Yoast SEO informs the web crawlers every time you publish new content. This makes it the speediest method to get new posts indexed. Your images are also indexed, meaning you can appear in image searches, too.